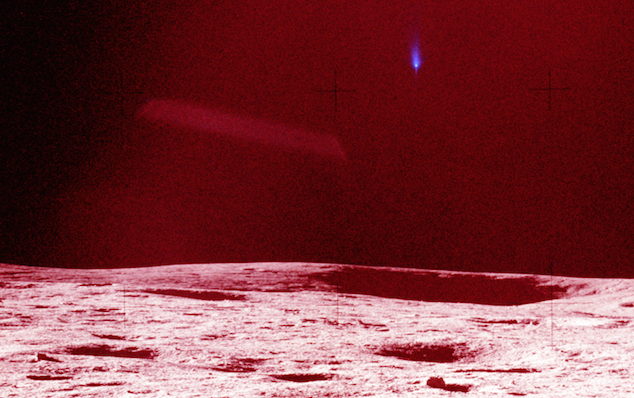 UFO SIGHTINGS DAILY: UFO Caught In Apollo 14 @NASA Photo Observing Astronauts On Moon! March 2016, Video, UFO Sighting News. UFO Caught In Apollo 14 @NASA Photo Observing Astronauts On Moon! March 2016, Video, UFO Sighting News. Streetcap1 of Yotube found this UFO over the surface of the moon. The photo was taken during the Apollo 14 mission, a maned mission that walked on the moon back in Feb 1971. In this photo we can make out a dark rectangle UFO mostly cloaked in the distance as it observes the astronauts. Why observe them? Well, if you had some strange people come onto your property, wouldn't you want to see what they were up to? Of course you would. Over 15 American and Russian astronauts have come out saying they saw UFOs in space...if we can't believe these heroes, then who can we believe? The Apollo missions were to observe, record and if possible retrieve alien technology.